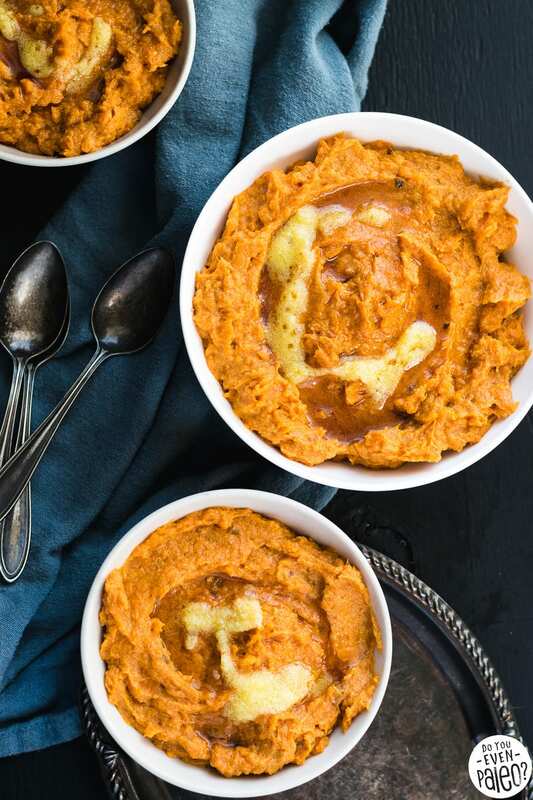 I think many people would argue that Maple Butter Sweet Potato Mash sounds like a wondrous, amazing thing. Well, it’s not a fantasy. 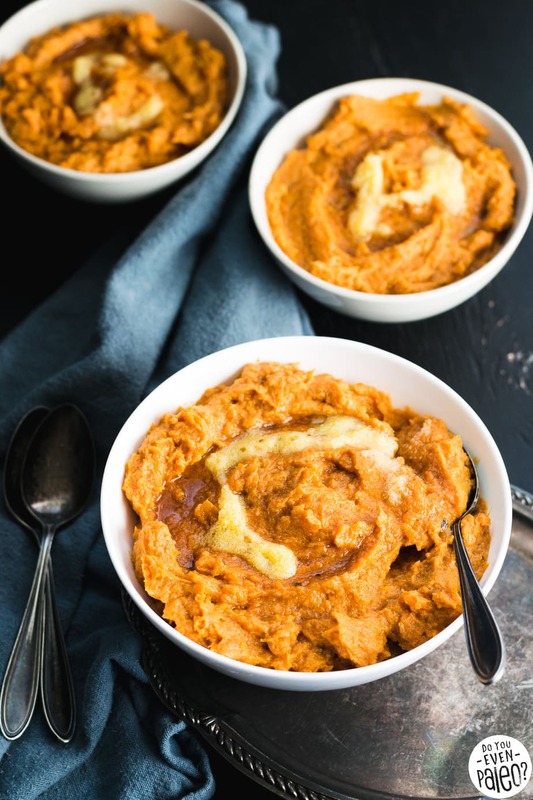 This recipe is going to become one of your favorite side dishes! 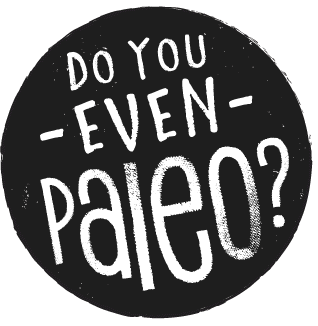 It’s entirely paleo, gluten free, and vegetarian. The ingredient list is mercifully short, but the flavor’s all there. 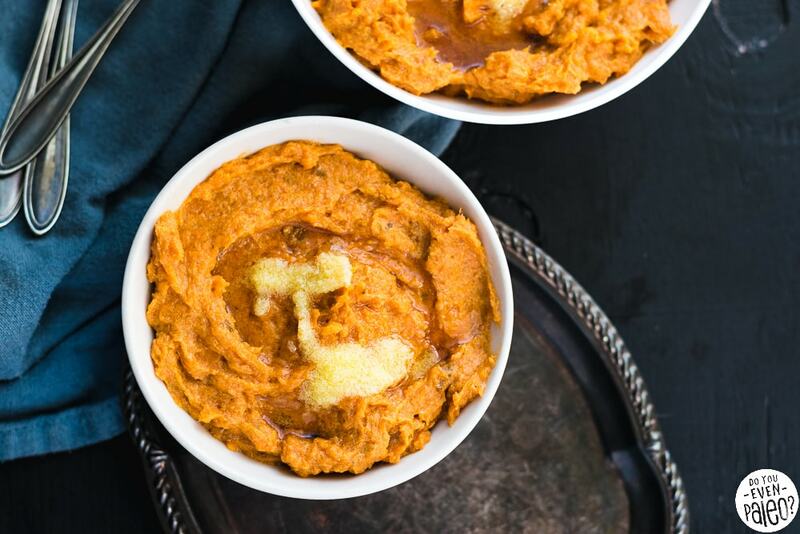 You’ll notice, if you’ve been following my blog regularly, that this recipe looks pretty dang similar to my Roasted Garlic Butter Mashed Sweet Potatoes recipe. Well, admittedly, that’s because it is really similar. I actually had the idea for this recipe before that one. Honestly, they’re both really super similar. 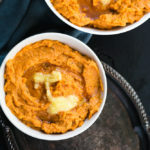 The main difference is simply that the roasted garlic version is sweet and this maple butter sweet potato mash is sweet. Common sense, right? But just like all recipes, simply swapping out a couple choice ingredients has a major impact on the overall flavor of the dish. 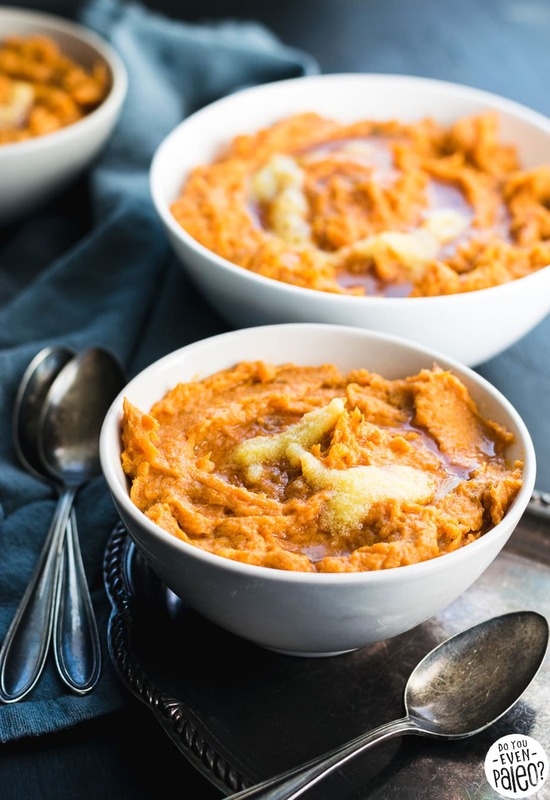 Maple syrup and sweet potatoes immediately sound like an ideal match; after all, that lovely, robust maple flavor enhances the existing sweetness of yams. I’ve always been a major sweet potato fan, but for the past year I’ve taken an unintentional break from them. See, I eat my fair share of white potatoes because they’re delicious and cheaper. So sweet potatoes kinda got pushed to the back burner for a while. Recently, though, they’ve made their way back to my plate. I mean, what was I thinking? Roasted sweet potatoes, sweet potato mash, sweet potato fries… You’ve just gotta have sweet potatoes in your life or you’re missing out. Use a fork to pierce holes around the sweet potatoes and wrap them individually in aluminum foil. Roast for 50 minutes or until tender and cooked through. Let the sweet potatoes cool slightly, then unwrap. 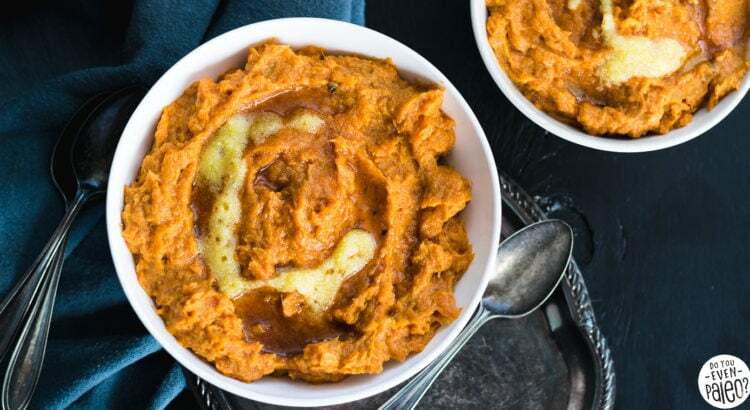 Run the sweet potatoes under super cold water for a couple minutes. The skin should slough off easily! Remove the skin and discard. Add the ghee, maple syrup, cinnamon, and sea salt to the pot. Mash again to combine. 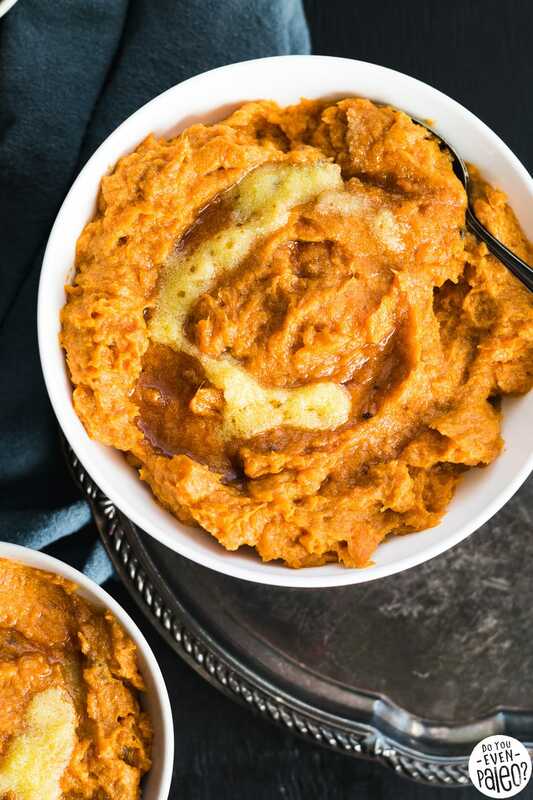 Use a hand mixer on medium speed to whip the sweet potatoes and ghee mixture together until smooth. Serve immediately or store in an airtight container for up to 5 days. If desired, drizzle with extra coconut milk or melted ghee when serving. Don't subscribe All Replies to my comments Notify me of followup comments via e-mail. 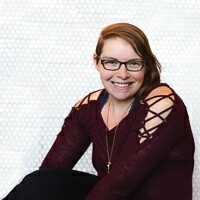 You can also <a href='https://www.doyouevenpaleo.net/comment-subscriptions/?srp=3725&srk=87505361eee98908ddf6ccb8681f50d6&sra=s&srsrc=f'>subscribe</a> without commenting.